How to make crepes(all you need to know to get it right the first time). Your step-by-step guide to making crepes. the one recipe you’ll need to get perfect crepes every time. you’ll be filling them with sweet and savory fillings to serve at breakfast, brunch or as quick desserts. I love my Sri Lankan food but I’ve got to confess Sunday breakfast usually means thin crepes with a simple sweet syrup made of jaggery Or just plain old sugar with melted butter and a dash of lime. 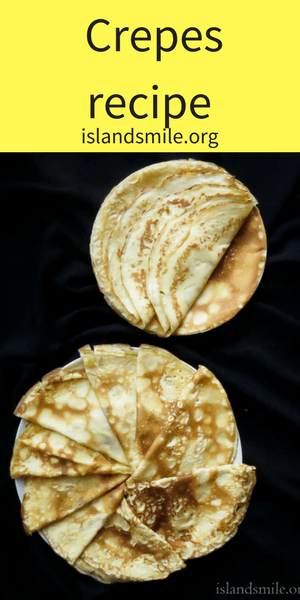 If you think making pancakes are easier than crepes, then yes, you are probably right, although they both use the same batter with a few extra ingredients for the pancakes. But crepes are so much better because they can be smothered or soaked in whatever filling you use, you’ll want to binge on them non-stop. And there are so many sweet and savory fillings, you can try a new flavor every single day and never get tired of it. The way to make perfectly thin crepes from the beginning is to get the ratio of ingredients and the consistency of the batter right. AND, of course, a good flat, non-stick pan to make those paper-thin crepes. you might also want to take your time getting the first crepe right by slowing down and paying attention to how much batter you pour into the pan and then the slow swirl of the batter to make perfect circles. Difference between pancakes and crepes? In fact, funny man and I had quite a discussion that bordered close to an argument. we kept swapping pics and terms from wiki. final say? He’s going to be calling anything made of milk, flour, and eggs as pancakes because that’s what he’s been calling it for the past**donkey years! Just so he ever reads my blog, I’m just going to leave a short note on the difference between pancakes and crepes. The difference between pancakes and crepes is mostly the batter. 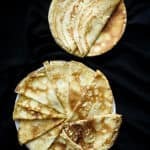 pancake batter usually has a raising agent like baking powder to make them thick and fluffy whereas the crepe batter doesn’t which in turn gives you thin, yet buttery soft and flat spheres to indulge with your favorite filling. Can I make crepes using pancake batter? 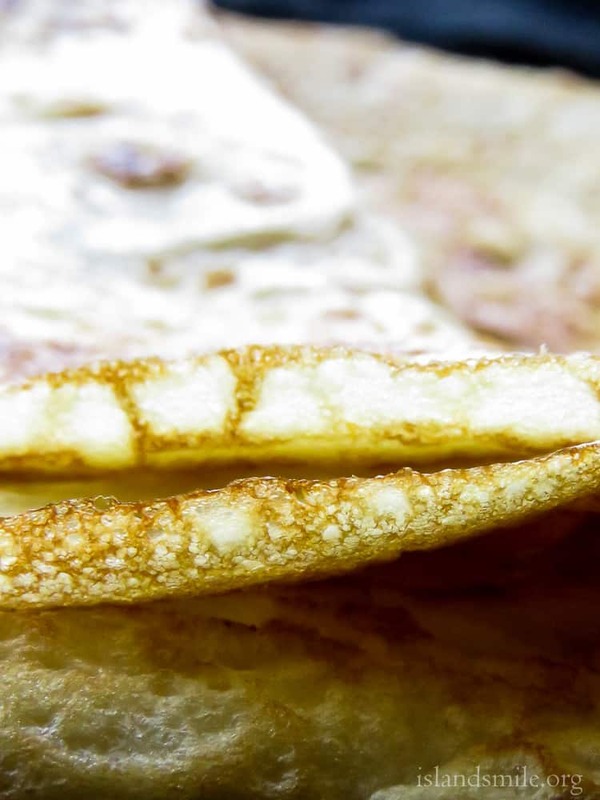 Crepes and pancakes use the same ingredients except for the raising agent in pancakes. so if you have a crepe batter you can definitely turn it into a pancake batter by adding baking powder or baking soda. but you can’t make a pancake batter into a crepe batter. Can I freeze extra crepes? 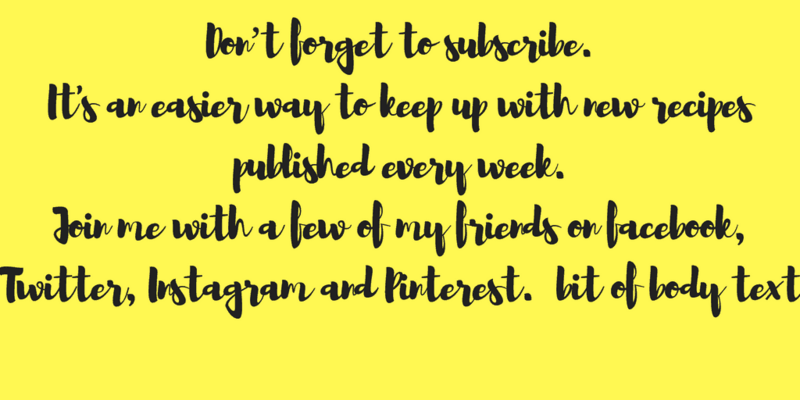 If you feel you won’t be using it for a few days, freezing them is a better option. to do this, any extra crepes can be individually placed on baking paper, stacked together then wrapped in clingfilm and placed in a ziplock bag. When you want to have them, remove from freezer, unwrap from the cling film and let the crepes reach room temperature before slightly heating them. How long can I keep the frozen crepes? I would suggest using them within 2 weeks. What should I do if the crepe batter is too thick? A thick batter means there is too much flour, pour in 1/2 a cup of milk and see if you have a smooth consistency that flows when you pour the batter. if you find the batter is still thick, add another 1/2 cup of milk. What should I do if the batter is too thin? what type of pan do I use for making crepes? 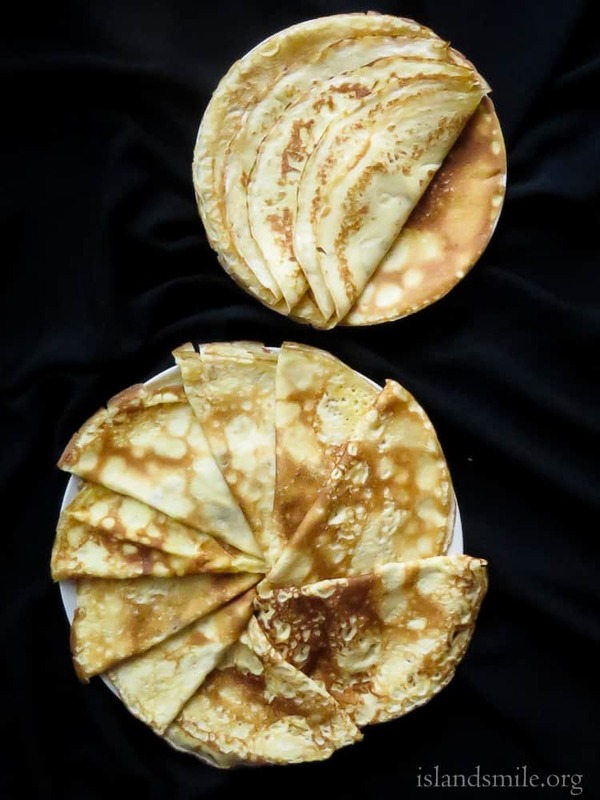 You don’t need any special pans to make paper-thin crepes, all you need is a flat-bottomed frying pan, preferably non-stick so that the crepes can be removed easily. Here’s what I do to make the crepes faster. Instead of using one pan to cook all the crepes, I use two pans side-by-side to make things move a bit faster when it comes to crepe or pancake making. 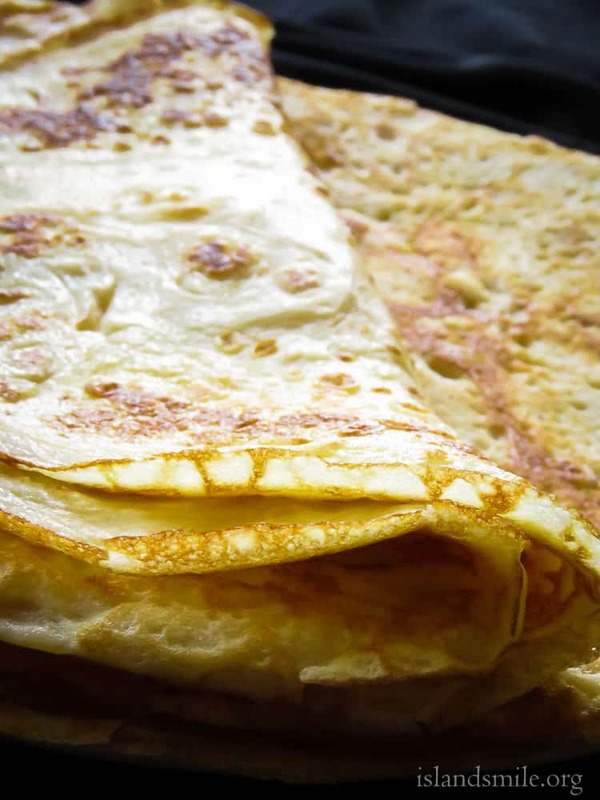 recipe- how to make paper-thin French crepes. In to a large mixing bowl, pour in a cup of milk followed by eggs and then salt, whisk until combined. Add flour to the bowl while gradually mixing it into a smooth consistency, make sure there are no lumps in the batter. Place butter in a small bowl and microwave for 15 seconds until it melts and pour the melted butter into the batter, mix well. To the thick batter, gradually add milk in 1/2 cups until you have the right consistency. The correct consistency would be thin but smooth and fluid. this would mean if you scoop a ladle of batter and pour it back into the bowl, the consistency should be like heavy cream. and should flow in one smooth stream, there should not be any breaks when you pour, if there are, it means the batter is too thin(instructions given above on what to do for a thin batter. Should you find the batter too thick, add milk in 1/4 cups until you reach the right consistency. Once the batter is done, taste and add salt if you need, you can also pour in 1 teaspoon of vanilla essence if your filling is sweet or fruity. You can use your regular frying pan, preferably the non-stick variety so that the crepe comes off the pan with the least amount of effort. use the flat-bottomed frying pan and not the ones that have a curved bottom to it. Heat the pan over medium heat for 1-2 minutes. Using a heat-resistant material spread butter on the flat surface, let the butter sizzle. Once you hear the sizzling, lift pan from fire and pour 1/2 cup of the batter right in the middle of the pan, tilt and using a circular motion spread the batter evenly to all side, making sure the batter spreads around. Immediately place the pan over heat, cook the crepes until the edges turn brown and crispy,1-2 minutes over medium heat. Gently insert a spatula to loosen the crepe and flip it to other side and cook until both sides are evenly cooked. Transfer crepe from pan to a plate, wipe the pan with butter and pour in the next cup of batter, continue until batter is over. Serve with your favorite filling and enjoy.